With DPP, can Josh Caddy be one of the top forward options in 2017? Josh Caddy looms as an interesting prospect in 2017. Whilst he has never averaged over 100 in his career, the inside midfielder averaged 85 points last year to back up 89 in 2015 and has been re-awarded with FWD/MID status for the second time in his career. Priced at $517,000, Caddy isn’t as expensive as some of the bigger name premiums, such as Dahlhaus, Macrae, Greene or Franklin. However with a change of scenery and guaranteed midfield-time at the rebuilding Tigers, there doesn’t appear to be pressure on Caddy to perform. This, as has been the case with many, can bring out the best in a player. Caddy was a regular attendee on the scoreboard for the Cats, kicking 18 goals and missing out on just three occasions whilst again proving he has Fantasy ability with hauls of 120, 105, 99 and 96 coming between rounds 6 and 9. He also managed three other scores in the nineties. Interestingly, he scored 94, 99 and 94 in three of his four trips to the home of football which will be Caddy’s third home ground. The Tigers kick of their 2017 campaign against Carlton at the MCG before facing arch-rivals Collingwood in their first home game of the season. From rounds 3-11, Richmond play five of the 2016 finalists (West Coast, Adelaide, Western Bulldogs, GWS and North Melbourne) before what will be a much anticipated week off in round 12. The bye rounds are not something I personally factor into my pre-season draft attempts unless there is an evident lop-sided round, however with just four teams having the week off in round 12, this is another, admittedly smaller reason as to why you should consider Caddy. If he can string successive games together then Caddy could prove to be a handy selection, potentially averaging around 90, without forking out the big bucks. Why shouldn’t I pick him?. Unfortunately, injury has always seemed to hinder Caddy’s game-time. Last year he managed 16 games after a mid-year knee injury kept him sidelined for five weeks and has managed to play all 22 home and away games just once. Given his hard-at-it approach, Caddy is prone to the odd impact injury but the Tigers will be hoping he can stay on the park where he will be an integral instrument alongside Brownlow Medallist Trent Cotchin and superstar Dustin Martin in the Punt Road midfield orchestra. Despite showing his talent at the Suns and Cats, Caddy never managed to really cement a place in the Geelong engine room. As a result, after his trade had been confirmed, Caddy declared the primary reason behind the move was to have a more prominent on-ball role instead of having to apply his trade off half-forward. 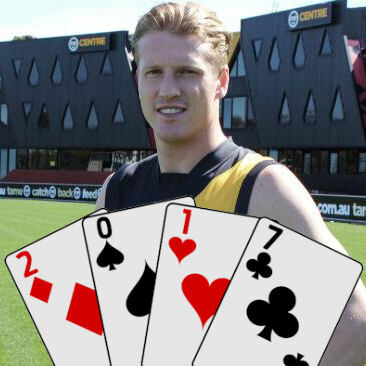 QUEEN – Who would’ve predicted Josh Caddy’s move to Richmond prior to the closure of the 2016 season? The strongly built inside midfielder with the ability to play across the half-forward line joins the Tigers as apart of a swap deal with Geelong which saw the Cats net picks 24 and 64. After originally being drafted to the Gold Coast Suns with pick number seven in the 2010 national draft, Caddy moved to Geelong ahead of the 2013 season, citing homesickness as the major factor in his decision to return to Victoria. He spent four inconsistent years at the Cats, displaying potential without ever truly living up to it. Now at his third club, I believe that the Tigers, Caddy’s game and his Fantasy output will benefit from the added midfield time. With his name already being thrown around in early draft teams, Caddy could end up being a popular Fantasy choice at F3. From his 89 games 12 times he’s scored 100 or more. From his 89 games 43 times he’s scored 70 or less. you do understand how difficult playing on a half forward flank is right? If you’re including early career games, even Gary Ablett’s numbers look underwhelming. Stats can be so helpful, but only in the right hands. Couldn’t agree more – a true midfielder positioned as a forward at a new club that needs him playing in the guts. He should be high on watchlists. I’m assuming that Caddy will spend 90% of his time as an inside mid.. I cant see him kicking 2goals a game from that position. Especially when he only averaged 1 goal a game last year when playing predominantly half forward for Geelong. Caddy is in my side as of right now, hes capable of 90+ if Richmond use him properly imo. Caddy’s inclusion is probs why they say Martin will spend more time forward this year. Caddy is Martin’s obvious replacement in the guts. This guy averaged 107 over a 10-game stretch for the Cats two years ago – he’s a beast when unleashed. I believe Richmond will do that, as so does Caddy – it’s how they won his signature. Locked for me, barring unforeseen circumstances.